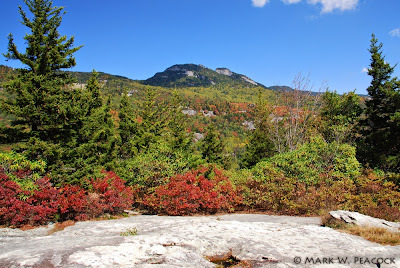 While the colors on the Tennessee side of the mountain have a couple of weeks to go, the area around Grandfather Mountain is quickly approaching peak color. This week and next will be the prime time to visit. Beacon Heights is a great place to take in the colors and some great views. 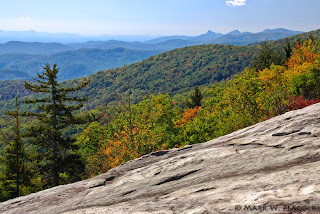 On a clear day, you can see in just about every direction from this huge rock outcropping. 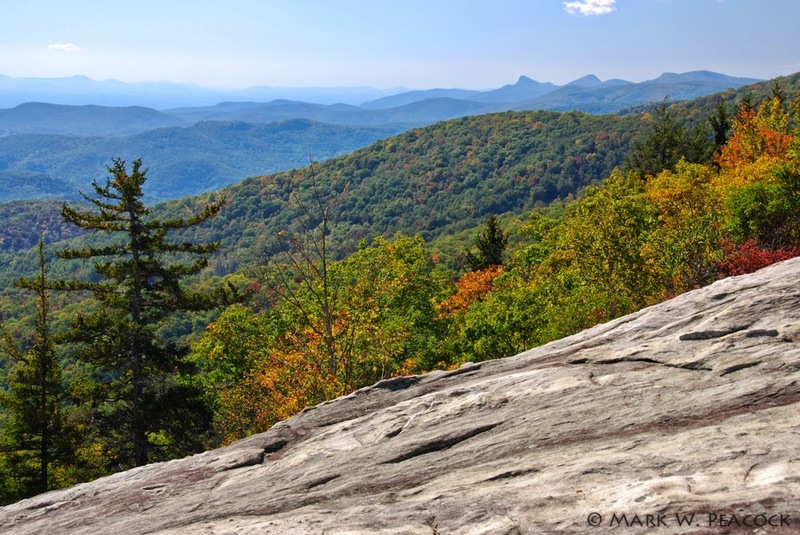 It's a popular stop along the Blue Ridge Parkway, not only for its view, but also because this overlook offers access to both the Tanawha Trail (which runs 13.5 miles to Price Lake) and the Mountains to the Sea Trail. The hike up to Beacon Heights is less than 1/3 of a mile - and of moderate difficulty (and I say that only because of the elevation change and some unsure footing). The shot above is a wide angle shot (10mm lens for you shutterbugs out there) that shows Grandfather Mountain (A portion of the swinging bridge is barely visible on the left side of the photo -- click to enlarge), MacRae Peak (in the middle) and Rough Ridge Overlook (to the right). Here and there you can see glimpses of the Blue Ridge Parkway. 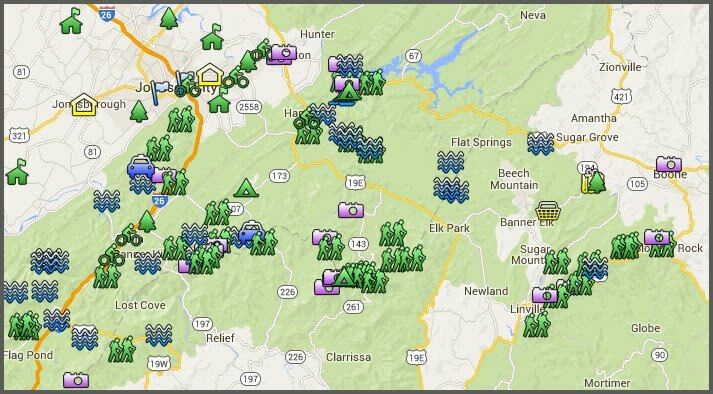 Location and Trail Description: Beacon Heights Overlook is located at Mile #305 on the Blue Ridge Parkway. The trail is well marked, just follow the arrows to the top. Once there the trail forks - I recommend you take the one to the left first (which takes you up to the view above) and then on your way back down, take the other trail to a different overlook that faces east and south. Directions from Grandfather Mountain: After visiting Grandfather Mountain, at the park exit turn left to get back onto Route 221, go approximately 1 mile to the entrance ramp for the Blue Ridge Parkway (the ramp is on your left). At the stop sign, turn right to head south on the parkway. Beacon Heights is the first overlook to the left. This is the best picnic spot ever. We stopped there today. Did anybody ever notice that the word "Beacon" is spelled wrong on the sign?